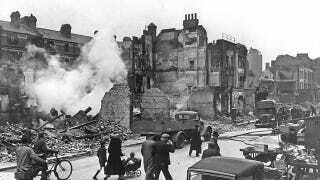 When bombs rained down on London during the Blitz, they fell on houses, on churches, and, less famously, on embankments along the River Thames. The damaged embankments could have sent devastating floods through London, but they didn't—thanks to a group of engineers who worked secretly and at night. Cities have a fraught relationship with their rivers. The Thames water that made London's very existence possible could also taketh away, occasionally flooding whole neighborhoods and drowning unfortunate souls. London had built up walls and embankments over the years to keep water in its place. By World War II, 2o square miles of the city laid below the Thames's highest recorded tides and 10 square miles below the river's usual spring tides. A breech in a river wall could have devastated those areas. Londoners had no idea how often and how close the city came to flooding. Records show that the Thames wall was hit by bombs 121 times during the war. Each time, they were repaired by a team from the Thames Flood Prevention Emergency Repairs, which worked under the cover of darkness to keep the London's vulnerability secret from its residents and its enemies. "It could have brought London to its knees very, very easily," said Gustav Milne, director of the Thames Discovery Programme, told the Associated Press. "Not just people drowning—we would have lost buildings, it would have flooded the sewers and brought up all the sewage, it would have contaminated the water supplies, cut off gas and electricity. There would have been widespread devastation and huge loss of life." The man behind all this was the engineer Thomas Pierson Frank, who was recently commemorated with a new plaque in Victoria Tower Gardens. His story, secret at first and then simply forgotten, had been unearthed by archeologists with the Thames Discovery Programme. Under Frank's direction, the Thames Flood Prevention Emergency Repairs was sent out, often when bombs were still falling, to repair broken river walls. They worked quickly and in the dark, piling up sand bags to temporarily slow the flow of water until the walls could be permanently repaired with concrete. Today, you can still see a patch of concrete in a wall otherwise made of granite near the Houses of Parliament in London.